Lesétablissements Tourneux‘s rocket ship hugs the stone walls of the historic castle, which was built north of Moselle in 1434. The castle opened to the public in 1998, and it now hosts a series of festivals and exhibitions. 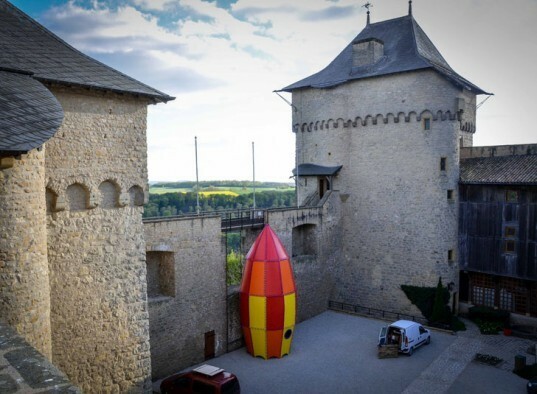 For this year’s program dedicated to the art of games and toys, Lesétablissements Tourneux was asked to design a fantastical structure that would evoke children’s stories and provide a place to watch the horizon from the castle. The fort-like spaceship structure was strung together using sturdy ropes and straps woven through perforations on brightly painted plywood pieces. 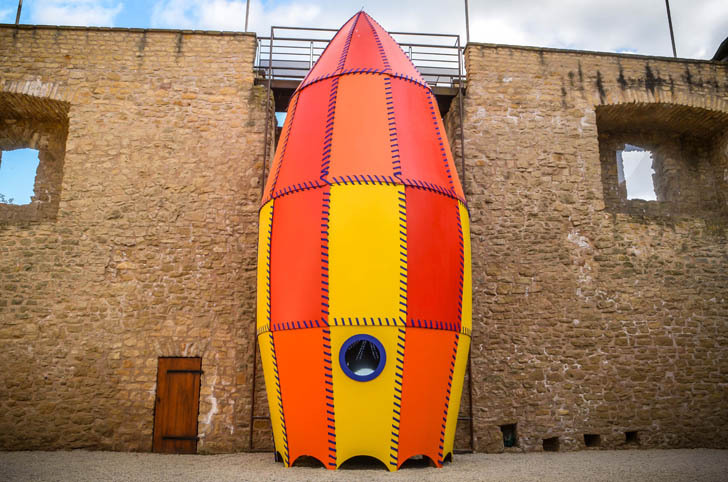 The piece was designed to look like a rocket from a vintage children’s book, appealing to both kids and adults alike. Inside, two portholes with mirrored windows give a view of the horizon beyond the castle. The whimsical structure spurs the imagination, inspiring the young minds who visit Malbrouck Manderen. Tourneux’s structure hugs the stone walls of the historic castle, which was built in the northern of Moselle from 1419 to 1434.